What’s this? A demented scrambeled egg? Crispy chicken skin? 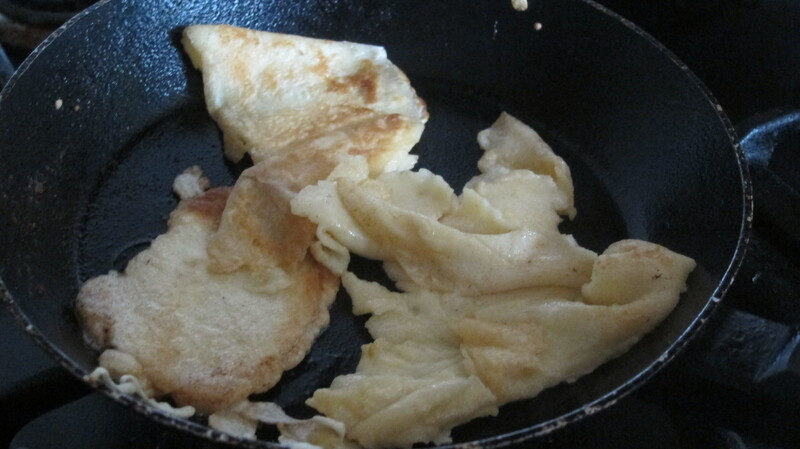 No, it’s my attempt at pancakes! Put 250g of flour into a bowl and add two eggs. Use a whisk to mix it all up. Put 150ml of milk and water together and gradually add it to the mixture while stirring. Melt 50g of butter (NOT in the microwave. A baker I know told me never melt your butter in a microwave), and put half of the butter in the mixture. Keep the other half of the melted butter for cooking. Put a spoonful of the butter in a frying pan and turn the gas on. Once the butter has gone all over the base, add in some mixture to cover the base. Now you have a pancake. You can coat it with sugar, butter, syrup, honey, jam, lemon juice… basically anything you think you like your pancakes with. Next The Daily Ben: Slug VS Miliband! A political outbreak! I agree — as long as they are eatable. One shouldn’t judge a pancake by its look!